It allows to characterize protein expression and secretion and also may serve to other IGEM teams that would like to express a chimera C-terminally attached to GFP, which exhibits bright green fluorescence when exposed to light in the blue to ultraviolet range. We also added GGGS amino acid twice as a spacer to avoid interaction between two consecutive proteins, allowing proper folding. This strategy was already applied to BBa_K1489002 part. 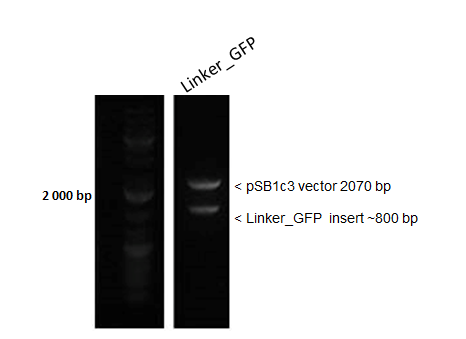 We added this part as an improvement to BBa_E0040, a green fluorescente protein, for protein fusion (see Experience page) . This part was characterized using two constitutive promoters from Anderson library (BBa_J23106 and BBa_J23117). See BBa_K1819006 and BBa_K1819007 pages for more information.